Here you will find answers to common questions about our language interpreting services. For which languages can I get interpreting services? We provide highly trained, certified interpreters, for more than 150 languages and dialects, who can assist with many types of scenarios such as corporate meetings, health care consultations and legal proceedings. Learn more about the languages we support. In which geographical areas do you provide interpreters? Can I receive interpreting services over the phone? Our highly trained interpreters are at your service 365 days a year, 24 hours a day throughout the Puget Sound region of Washington state, and for phone interpretation (telephonic interpreting or OPI – Over the Phone Interpreting) anywhere in the world. How do I schedule an interpreter? Simply call us today at (206) 244-6709 to discuss your needs, and we’ll match you with a highly skilled interpreter who has experience related to your situation. Can I work with the same interpreter every time? Absolutely. Particularly for sensitive situations such as healthcare consultations or legal proceedings, we understand it’s more comfortable to work with the same person every time. We carefully screen our interpreters to match the specific needs of each customer. Additionally, each interpreter is required to sign a confidentiality agreement to work with us—and with you. How do I receive confirmation an interpreter will be available? Once an interpreter has been assigned to be at an appointment, confirmation generally comes in one (or more) of three ways: via email, phone call or fax. We are flexible to the needs of each individual client as to the preferred or required method of confirmation. All appointment information is contained within this confirmation to ensure the accuracy of details regarding the upcoming appointment. How should I interact with an interpreter? The important thing to remember when using interpreting services is to pretend that the interpreter is not there. Keep your eyes on the person you are speaking with while you listen to the interpreter. A good interpreter will fade into the background as time progresses and you get used to the presence of a third voice. Do you provide simultaneous interpreter services? Yes. 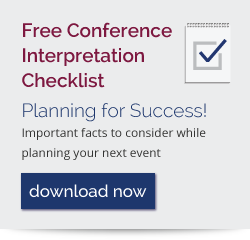 Dynamic Language provides highly skilled and professional simultaneous interpreters for events ranging from conferences, legal proceedings, corporate meetings and more. We can also assist you with interpreting equipment rental needs. What services do you offer for communication access for those who are deaf? To help you better communicate, we can provide sign language interpreters for the deaf/hard of hearing who use ASL, PSE, SEE, etc. We also offer services by interpreters who are skilled in transliteration for the deaf/hard of hearing who primarily read lips. And for those who do not use any form of sign language but are fluent in English, we provide Real Time & Remote Captioning services. Do you provide interpreter services for clients who are deaf and blind? Yes, we do! Our skilled interpreter would use a form of sign language called Tactile, where signing is done on the hand of the client so they can feel the signs through touch and movement. My client is Ethiopian. Which languages do you offer for this region? Dynamic Language provides numerous languages for this region. The most prevalent languages spoken in Ethiopia, for which we have interpreters, are Amharic, Oromo, Somali and Tigrigna. One of the ongoing positive things with Dynamic schedulers is that they are always very understanding and work hard to get our organization what we need. Also, our clients ask for the same interpreters a lot and that is a wonderful endorsement. I really appreciate how friendly staff always is, how helpful and how quickly interpreters are scheduled, even when I’ve had last minute requests to fill. The interpreters have been very respectful and friendly to my clients who are usually struggling with personal crises and I truly appreciate their level of empathy! The quality of most of our interpreters has been outstanding over the past several years. They are professional and highly skilled, as well as sensitive and compassionate to the students and subject matter discussed with families of students with disabilities. The professionalism and expeditious responses by the staff are exceptional. The staff offer multiple ways to get things done and to track. Thank you. I have worked with Dynamic Language for over two years using various services (telephonic interpreters, physical interpreters, and document translation) in several languages as a Case Manager for an International Foster Care program and I have always had a wonderful experience. I would absolutely recommend Dynamic to anyone needing professional interpreting or translation services. Some interpreters approach the job as a simple job of communicating the message required and walking away. But our experience with Dynamic Language has been different. Their interpreters sympathize and empathize with the situation, for we all know that emotions, feelings, and non-verbal communication can be just as important as the actual words said. They give you the whole package for one low price. I strongly recommend.